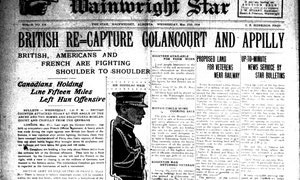 Newspapers, whether historical or current can be a fabulous research tool for genealogists. Newspapers can provide such a rich source of daily or weekly information about our ancestors lives for a particular era, their customs, cultural values and social issues which impacted communities on local and international levels. With regards to family history, newspapers are beneficial for searching our ancestors’ death notices or obituaries, personal announcements and celebrations, community involvement, social news and gossip, lodge and club news, employment ads, real estate transactions, legal notices, court rulings, criminal activity, casualty lists and military news, and so much more. 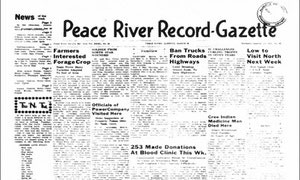 In locating events of our rural ancestors, it is helpful to research newspapers specific to particular neighborhoods or towns, ethnic enclaves and religious affiliations. Local newspapers often illustrate community news by capturing details of our ancestors’ lives that may not be found in other genealogical records. The general websites "Where to look for Alberta Newspapers" below can help viewers locate Alberta newspapers that have been digitized, on microfilm or in hard copy. Our first suggestion is to review Gloria M. Strathern's book Alberta Newspapers, 1880-1982 for a newspaper in a specific locality. Some have been digitized by Alberta's university's. The list along the right are newspapers that have been proudly indexed by our AGS Branches. By clicking on the icon, links to a webpage where valuable information awaits to get the reader started. The Edmonton Journal obituaries database was compiled by several dedicated staff members of the Milner Information Services, Edmonton Public Library from the 1980's to 2012. This webpage not only has a database from 1950 to 1982, but lists a variety of resources for other years for researchers to use. Featured on the Our Roots website, Gloria M. Strathern's exhaustive historical directory makes it possible for the researcher to review the role of the press and locate home town Alberta newspapers on microfilm or in hard copy. 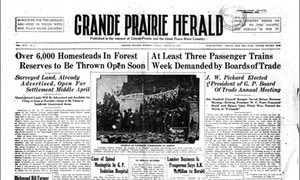 Looking for a comprehensive Alberta newspaper collection? The Legislature Library has served the information needs since the provinces inception in 1906. Although its primary clientele are Members of the Legislative Assembly, its resources are available to the general public. This digital Alberta newspaper collection contains daily and weekly newspapers covering most of early Alberta, 1885 to 1950. Currently, the collection is organized by place and date. This is a ongoing project developed by the University of Calgary Press in partnership with several other Alberta museums, archives, educational networks and universities. Peel's Prairie Provinces is a digital resource dedicated to assisting scholars, students, and researchers of all types exploring western Canadian history. Small town and major centre newspapers are digitally featured online for Western Canadian provinces. 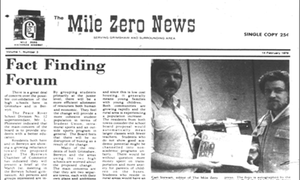 The provincial archives has an extensive collection of Alberta community daily and weekly newspapers on microfilm. A digital scanner and microfilm machines are provided. The extent of the holdings covers approximately seventy communities throughout Alberta. Located in southeast Edmonton, the archives is nestled on the corner of 8555 Roper Road and 86th Street. Free parking, and coffee area available. Historical newspaper collections of local Alberta and larger Canadian cities, such as the Vancouver Sun, Toronto Star, etc. can be found available on microfilm at the University of Alberta, Rutherford Library North, 2nd Flr. Digital scanners are available. Bring your thumb drive. Many large and small public libraries throughout Alberta are tied to The Alberta Library system. Here researchers can search for a newspaper within local library collections or request microfilm on a interlibrary loan basis.